YOUNGSTOWN, Ohio – U.S. Rep. Tim Ryan blamed a “poor national brand” for Democrats not fully capitalizing on opportunities this midterm election. Ryan, D-13 Ohio, last night won a ninth term in the U.S. House of Representatives, which flipped to Democratic control. The party also claimed several governorships. However, despite U.S. Sen. Sherrod Brown, D-Ohio, winning a third term, Republicans strengthened their majority in the Senate and the GOP again swept the top statewide offices in Ohio. The 60.8% of the vote Ryan garnered in his win over GOP challenger Chris DePizzo — according to unofficial results from the Ohio secretary of state’s office — was well below his normal percentage. In his last three elections, he claimed at least 67.7% of the vote, and in four of his general election wins he has polled above 70%. In 2010, the year that Republicans made huge gains nationally, Ryan got 53.9%. In that race, he faced two opponents, one of whom was former U.S. Rep. James A. Traficant Jr. This year, Democrats had “some great candidates,” but the party lacked a national spokesman to get its message out, Ryan said at the Mahoning County Democrats’ watch party at Avalon Downtown. Democrats “lost the narrative” on issues such as the caravan of Central American migrants, the economy and GOP plans to “gut” Medicaid and Social Security. Democrats last night proved they have lost ground in the Midwest and seem to be most competitive in areas of population growth and diversity, said Capri Cafaro, former state senator and executive-in-residence at the American University School of Public Affairs. And in Mahoning County, two Republicans surprised in upsets that upended the control of legislative seats held by Democrats for decades. Republicans Michael Rulli and Don Manning claimed seats in the Ohio Senate and Ohio House of Representatives, respectively. 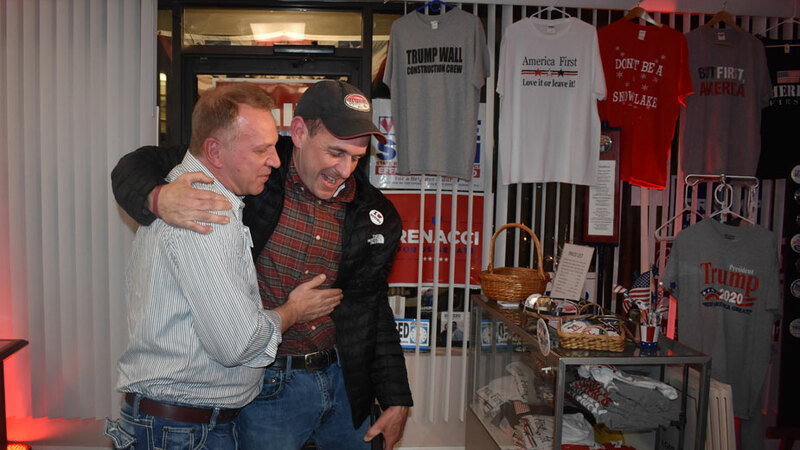 Both attended the victory party at the Mahoning County Republican Party headquarters in Boardman. “I think I bridge a gap, a disconnect between politicians and people on the streets,” Rulli said. Republicans Don Manning and Michael Rulli claimed seats in the Ohio Senate and Ohio House of Representatives, respectively, that were long held be Democrats. Rulli, who won election to the Ohio Senate’s 33rd district seat now held by Joe Schiavoni, defeated John Boccieri, a former congressman and state senator. County voters wanted “a different approach to politics” and were tired of “humdrum politics” locally for the last 50 years, Rulli said. He said he plans to meet with Schiavoni so he can “hit the ground running” in Columbus. “Mahoning County has been on the brink of opening up their minds to other thoughts, maybe other thought processes,” said Manning, who claimed a narrow win over defeated Eric Ungaro, according to the unofficial results, to represent the 59th district in the Ohio House of Representatives. “Most people decided that it was time to make a change to see if there’s anything better on the other side. We’re going to prove that there is something better on our side,” he said. Both political parties are undergoing an “ideological realignment and Mahoning County may be a product of that shift,” Cafaro said. In another closely watched race in Mahoning County, attorney Molly Johnson topped a six-candidate field for the county court seat in Sebring that covers the southwestern part of the county. She will replace Judge Diane Vettori-Caraballo, who was suspended for allegedly stealing from a deceased client. Johnson said she wants to “restore honor and integrity” to the court following her predecessor’s indictment. She also plans to work with the specialized dockets section of the Ohio Supreme Court to reinstitute the misdemeanor drug court. She thanked voters, her family and Columbiana County GOP Chairman Dave Johnson – not a relation – who was “very helpful” to her campaign. Ryan in recent days has been the subject of speculation that he might again challenge Pelosi for leadership of their party’s caucus. He didn’t rule that out last night, and said he was making calls to assess last night’s results. He cited an exit poll that showed Pelosi’s unfavorable rating at 55%, the same as President Donald Trump, while Republicans’ rating was at 54%. Cafaro agreed that Ryan should challenge Pelosi or at least seek a leadership post within the party. “The Democratic House leadership needs someone who understands and can reconnect with the heartland if they want to be competitive in 2020,” she said. Pictured: U.S. Rep. Tim Ryan joined Democrat supporters at an election night watch party in downtown Youngstown to watch results come in.